Once again we've been blown away by the creative street images and participation of so many photographers around Wales on Instagram. Even just a cursory glance at the Instagram #urbanwales feed will show a diverse mix of landscapes, cityscapes, people, fashion, events and textures to name but a few. Hashtags don't die - so keep posting your best work and we look forward to admiring even more creative photography from around Wales in 2018! Although we had a fantastic response during 2016 for the first #urbanwales outing and 6 photographers making it through to the final of our competition award at The EYE International Photography Festival in Aberystwyth, we thought it might be cool to be more inclusive for a larger number of photographers to have their work showcased offline from the Instagram feed. The result was a limited edition 36 page printed Zine packed with 47 great images selected by Ffoton and guest judges Paul Sampson, gallery curator at Oriel Colwyn; and Kevin Mullins, wedding & street shooter and Fujifilm X Professional. A limited number of copies of the zine are still available to purchase at time of writing (December '17) so ask any of the Ffoton team at one of our future events or email us. The great cover image for our first Zine was by the keen-eyed Matthew Eynon. We partnered up with the developers of the fantastic BLACKIE camera App for iOS for 2 weeks in August '17 to award a free camera app each day to the best monochrome #urbanwales image on the Instagram feed. We asked four of the most active photographers posting #urbanwales-tagged images on the Instagram feed if they would like to show a selection of their work on the walls at Little Man Coffee Co. in Cardiff through October '17 - and the venue liked it so much, they asked if they could keep them up for another month! Massive thanks to photographers Alex Butler, Matthew Eynon, Neil Johannson and Nick Treharne for taking part. Click on their respective banners below to see what they chose to exhibit. All images featured here and in Ffoton #urbanwales activities are owned and © respective photographers and used with permission. It was a great pleasure to announce Peter Jones as winner of our #urbanwales competition in the final hours of The EYE International Photography Festival in Aberystwyth on Sunday 2nd October 2016. Delegates at the Festival voted for their favourite image from the six ticket winners on show in the main foyer area of Aberystwyth Arts Centre - and Peter's great mono image of an elderly couple grabbing a nap had the majority vote! Peter wins a free annual subscription for a Pixelrights website to host his photography portfolio. And our 5 other finalists didn't go away empty handed. In addition to their free weekend ticket to The EYE Photography Festival, each received a limited edition copy of the Portrait Salon 2015 Catalogue courtesy of James O Jenkins and Portrait Salon. and how you can get 30% off a new Photography website with Pixelrights! The Competition might be over but our #urbanwales hashtag lives on! AN EXPERIMENTAL PROJECT FOR 2016. Over the last twelve months of producing Ffoton, we have been struck by the sheer number of talented photographers from all parts of Wales who are shooting great work in all manner of photographic genres, but who rarely show their images publicly. As part of a project to promote some of this unseen work, Ffoton would like to introduce Urban Wales - an initiative to highlight contemporary photography from Wales. Whether you live, work or just visit any Welsh city, town or village Urban Wales will allow us to highlight your creative interpretation of the public spaces and people around you. So, from today, we’re inviting you to post your favourite images shot in Wales to either your Flickr or Instagram account. Using these hashtags will allow anyone to easily search for and watch the Ffoton project unfold. But we’ll have more to share on the project over the coming weeks! Welsh Documentary photographer Dan Wood speaking at the last of three Ffoton Talks held in Cardiff over April - June 2016 as part of the Ffoton Wales #urbanwales open participatory photography initiative on Instagram and Flickr. Well known for his intimate 'Suicide Machine' documentary study of his hometown of Bridgend, Dan has finally ended this project and captured it in print with his first book of the same name - published by Another Place Press. Ffoton's Emyr Young talks with Dan about the genesis and conclusion of the project - and some of the encounters along the way. Recorded at The little Man Coffee Co. in Cardiff 23 June 2016. Welsh Documentary photographer Roger Tiley speaking at the first of three Ffoton Talks held in Cardiff over April - June 2016 as part of the Ffoton Wales #urbanwales open participatory photography initiative on Instagram and Flickr. Roger is an accomplished photographer - well known for his intimate coverage of the mining communities and Miners Strikes during the 1980's in South Wales. 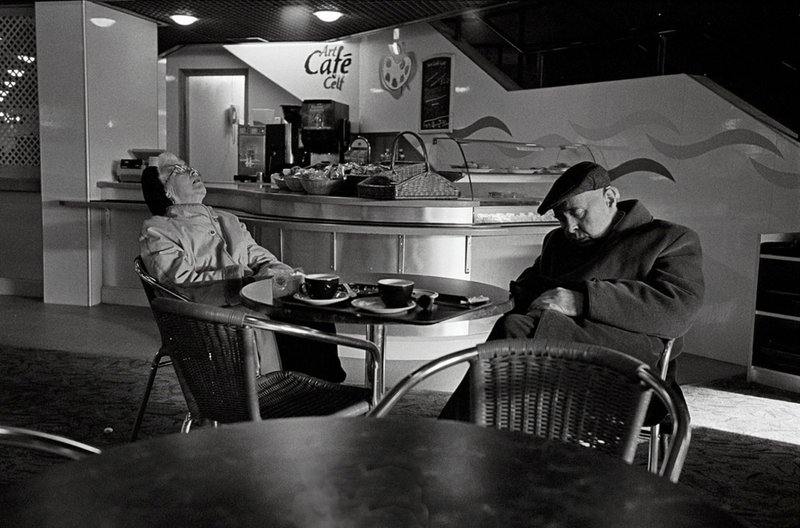 He studied under Magnum Photographer David Hurn on the original Newport Documentary course and has continued to exhibit his work in the UK and Internationally as well as publish books on his work. Recorded at The little Man Coffee Co. in Cardiff 21 April 2016. Ffoton Wales are delighted to be back at The Littleman Coffee Co.
for our new 3 month #urbanwales takeover! We have some great gritty photography lined up 4th April through to 2nd July in Littleman - both upstairs and downstairs. Our new show presents 3 very talented but stylistically different photographers from Wales who enjoy shooting creative Urban images. And downstairs, we have yet more photographers who have been busy with our #urbanwales hashtag on Instagram and Flickr. We're also excited about the style of the show - we think it'll have some impact!